:Drawing on the expertise of the Arthur Rank Centre, Resourcing Rural Ministry offers an in-depth exploration of the key aspects and challenges of leading a rural church. Relevant for ordained and lay leaders alike, the resource contains real-life case studies and workbook-style material, offering practical guidance and suggested actions. Includes links to the ARC's training programmes, web-based resources and publications. Simon Martin has been Training & Resources Officer at the Arthur Rank Centre since 2005, having earlier spent nearly 16 years working in general and theological education with the Church of Uganda. This was followed by five years of full-time lay ministry and local church training delivery in the UK. 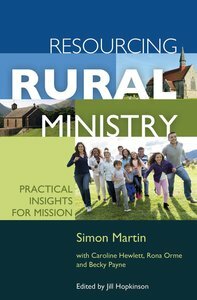 He has written a wide range of resources and training materials for rural churches including on mission, evangelism, Messy Church and discipleship. Simon is committed to developing the ministry of lay people within the rural church. He has previously published books on discipleship and small group leadership.